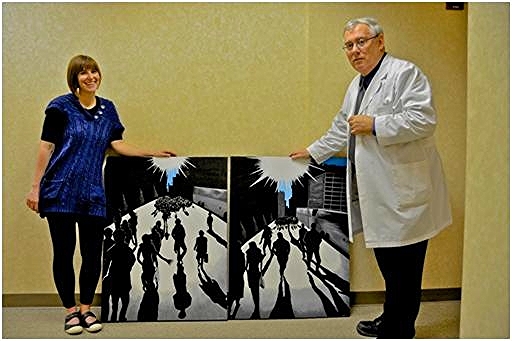 Canadian artist, Meghan Sims and her father, recently stopped by the Low Vision Center of Indianapolis to see Dr. Windsor and to donate two wonderful pieces of her art to our clinic. Meghan is a very talented visually impaired artist from Kitchener, Ontario who wears contact lenses specially designed by Dr. Windsor to control her severe glare problems from Achromatopsia. Despite being visually impaired, having severe glare problems and no color vision, Meghan produces amazing pieces of art. Our Indianapolis office features two of her painting. We also have one piece on display at our Low Vision Center of Fort Wayne. Our Achromatopsia Clinic sees patients from around the world. To learn more about Achromatopsia, visit www.Achromatopsia.info.